The motorway sculpture called ‘The Hitchhiker’ has been stolen from the M7 motorway near Monasterevin in County Kildare. It was a 3.5 meter high piece of bronze (see left) and weighs 1000kg. See the newspaper article here. It is thought that the theft was motivated by the current high price of metal rather than any desire for the sculpture itself. Interestingly in the newspaper article the original artist estimates the scrap value would be €30,000. But I think this might be an over estimation. Assuming the bronze used contains 60% copper with 40% zinc, then the current market value of it would actually be around €10,000. I had passed this sculpture many times, but didn’t usually take much notice of it. It was nondescript and I was usually more interested in taking a peek at the adjacent River Barrow to check the water level. This river is prone to overflowing its banks in winter and flooding the surrounding fields. 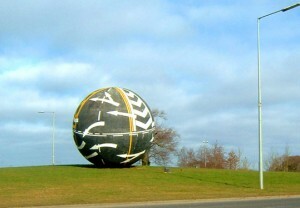 If pushed for an opinion I would say the sculpture was a piece of the usual bland motorway art which is dotted around the country. We are told this is art, but in most cases, I would disagree. Which leads us on to a question, what is art? For something to be considered art surely it should meet at least some of the following criteria? Difficult to reproduce (i.e. valuable, unique), thought provoking (i.e. useful, provoke a debate) and enjoyable to look at (i.e. beautiful, interesting). Most modern art wouldn’t score very well if measured against this criterion, including ‘The Hitchhiker’. Another example of motorway art close to ‘The Hitchhiker’ is what looks to be piles of turf at the M7/N8 junction. It is badly positioned between two overpasses and these hide it from view. When moving at motorway speeds it is only possible to view it for a few seconds. In Ireland we are lucky, for the most part, to have a varied and scenic landscape surrounding our motorways. As the landscape is interesting; does it really need to be enhanced by an expensive piece of metal? The budget for art work on Irish roads was set at 1% of the particular schemes budget, but not exceeding €60,000 for any one piece. 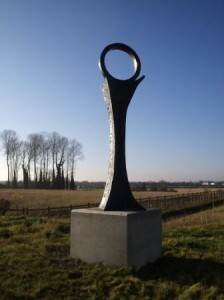 Due to the inflated price of ‘art’ this amount of money only created small insignificant pieces, few of which are clearly visible at motorway speeds. It may have been better to build a small number of larger landmark pieces, rather than lots of small bland ones. 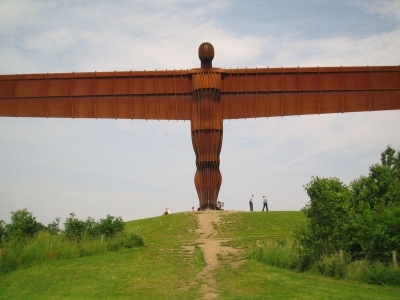 Consider the ‘Angle of the North’ in England. This is perfect for travelling at motorway speeds as it is large, visible for a long time and its orientation changes slowly as you speed by. Therefore travelers have time to appreciate it. It has become a tourist attraction in its own right. 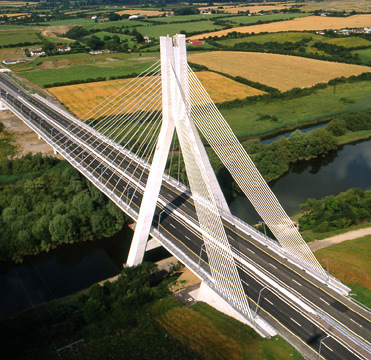 The Irish motorway network has a grand total of three online service areas. Perhaps an alternative use of the funding spent on artwork would have been to provide additional ones. In my opinion the real motorway art forms are the bridges. Some of these have made a bigger impression on me than any of the motorway artwork and they are functional as well. In case you think I am against all motorway artwork. Here are a few examples that I like. 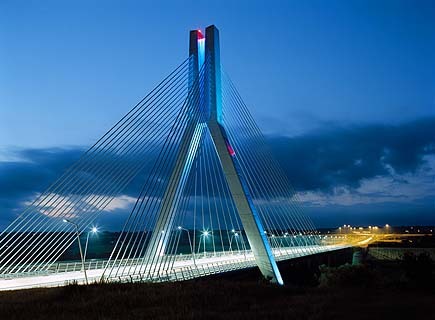 The M1 Boyne bridge, better than most artwork and functional too. 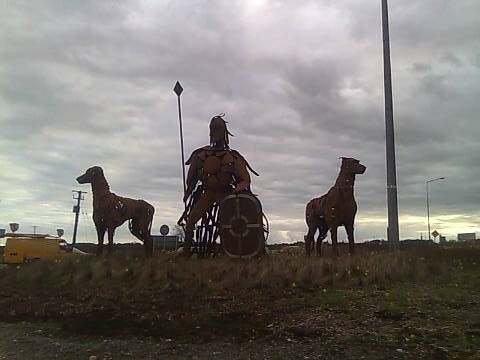 And another, suggested by Ann Casey, called ‘The Gaelic Chieftain (An Gobn Saor)’, located on the N4 between Boyle and Sligo. 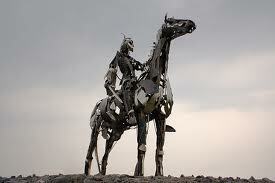 Have you seen the warrior on top of the Curlew mountains between Boyle and Sligo on the N4? He is spectacular! Ann, I didn’t see it myself. The last time I was in Sligo I got the train. But from the photograph I found of it on the web, its my kind of motorway art: positioned well, large, skillfully made and memorable. I have added a photograph to the end of my post. Thanks for pointing it out. Nice post, the highway art is impressive…. I enjoyed your comments as much as your photos in this post. Of course, the question, “what is art?” is always a provocative one. You explain your perspective very succinctly.